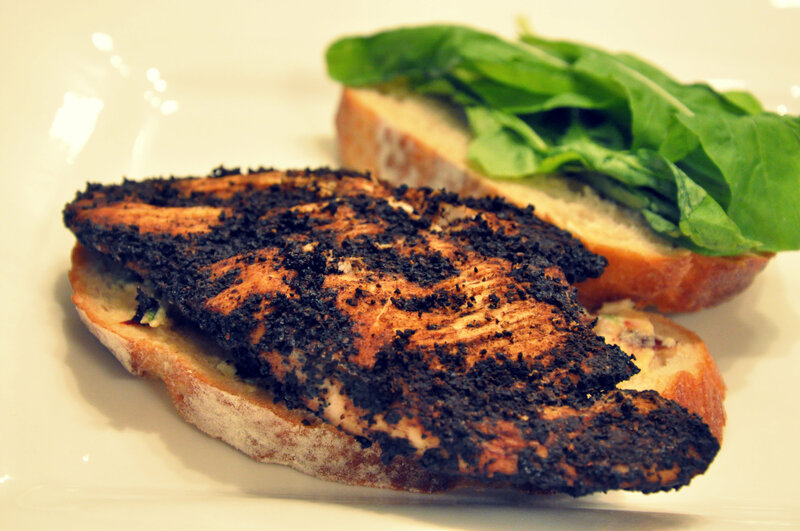 Ground coffee, which serves as a dry rub for the chicken, provides an excellent smoky flavour. Together with the cheese date spread, it creates a nice balance with rustic sourdough bread. In a medium bowl, mix all the ingredients for the rub until it becomes a paste. Take each chicken breast and coat with the coffee marinade. Place the well-coated chicken breasts on a separate plate, cover with cling wrap and refrigerate for two to three hours. Preheat oven to 180°C and roast chicken in a tray lined with aluminium foil, uncovered, for 15 minutes. For the cheese spread: mash the goat cheese in another bowl and fold in the remaining ingredients until it resembles a spread. To assemble the sandwich: Place the arugula leaves on one side of the bread. Spread the cheese and arrange the roasted chicken and serve. You can even add sliced tomatoes.